This book provides ideas for textile artists in using modern-day materials to create clothing in the style of traditional ethnic garments. It discusses both traditional embellishment techniques as well as the use of modern-day materials and tools such as machine embroidery. This book describes how to make six different garments from various countries around the world. It opens with an overview of ethnic clothing, then devotes about 50 pages to describing different embellishment techniques, and then ends with instructions on how to draft patterns and construct the six garments. Although it covers a variety of places from around the world, this book contains enough information about the Middle East and North Africa to be interesting and useful to people who appreciate folk arts from that region. 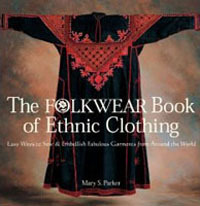 The book opens with an overview of ethnic garments. It discusses traditional garment shapes, such as the tunic, the pull-on pants, the shift, the unconstructed rectangle (such as saris), the coat that is open in the front, and more. It talks about parts of the world where each of these garment types was worn, accompanied by wonderful illustrations of old photographs. The largest section of the book (over 50 pages) is devoted to embellishment techniques. This section is presented as a combination of ethnic lore and recommendations on how to use modern-day materials to achieve the look. It addresses dyeing techniques, embroidery, appliqué, patchwork, and more. For each of the above garments, the book shows drawn-to-scale patterns and offers detailed instructions on how to make it. At the time this book was published, its publisher (Lark Books) also owned the Folkwear line of patterns for making ethnic clothing. This book's patterns all match with patterns available from Folkwear, so if you didn't want to draft your own pattern you could buy the corresponding Folkwear pattern and then use this book to learn more about the garment than what the pattern envelope contains. From the perspective of those who are seeking information on Middle Eastern and North African dance and costuming, there is enough information about the region to make the book attractive. The introductory chapter, with its overview of ethnic clothing, contains quite a bit of information about clothing from the region. The embellishment chapter explores motifs used in Jordan, Palestine, Turkey, Syria, Bahrain, and Egypt, which should offer inspiration for dancers seeking ideas for decorating their self-made bra / belt sets, skirts, and veils. This section also offers information on how to embroider the yoke of the Syrian dress using a sewing machine rather than cross-stitch embroidery by hand. You would like to make costumes suitable for dancing debke. You enjoy doing needlework, particularly using ethnic designs and techniques. You are fond of patterns by the Folkwear pattern company. You would like some ideas on how to make garments you could use as cover-ups. You are intrigued by the different design motifs that appear on clothing from the Middle East and you'd like to learn more about them. You appreciate ethnic clothing from all over the world, not just the Middle East. You have no interest in ethnic textiles or garments. You have no interest in learning how the embellishment on traditional Middle Eastern garments was done. I am very enthusiastic about the informative section on embellishment, which covers designs from a variety of places throughout the Middle East. I think the instructions for using machine embroidery to embellish the Syrian dress are excellent, and result in a convincing design. The opening chapter, with its overview of ethnic clothing, is done very well, and contains a great deal of information about Middle Eastern and North African garments. The bibliography lists a number of additional books that have piqued my interest. The table of contents and index are excellent, and both are valuable tools in helping me navigate the rich content in this book. I'm not so sure about the author's use of spiritual motives (such as avoidance of the evil eye) to justify traditional people's use of embellishment on garments. It may be true in some cases, but she doesn't offer footnotes to support those assertions, and I'm a bit skeptical. I'm not particularly interested in the clothing styles of some of the places represented in this book. The captions on the photos don't always identify which garments are actual historic pieces versus which are modern-day replicas. This book is out of print and used copies vary widely in price. Shop around to find the best deals. The book is beautifully made, with a large number of full-color illustrations, and the text is informative. I have long been a fan of the patterns sold by the Follkwear pattern company. I therefore was favorably inclined toward this book because it augments the information that comes with the patterns. I personally enjoy doing embroidery and other needle arts, so part of the reason I like this book so much is that it contains a great deal of information about these textile arts. If you don't share my passion for doing hand embroidery, you might find this book less to your taste than I did.